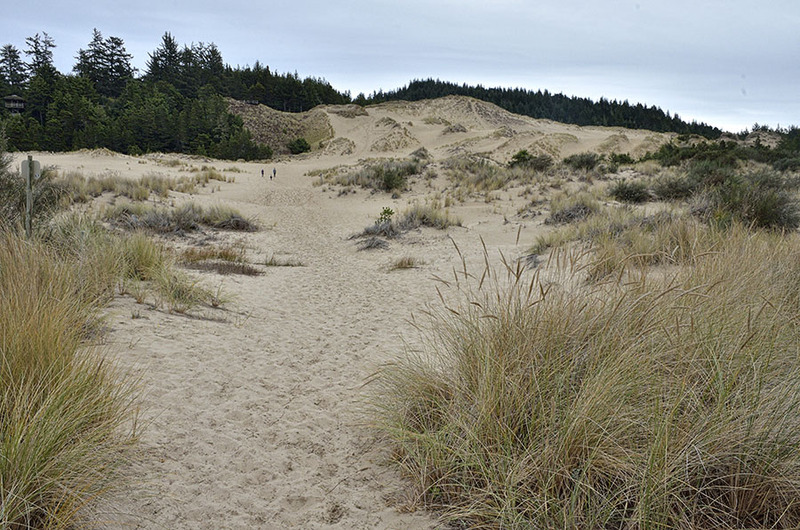 It could be a cool name for a band, but “Florence and the dunes” just names more of the places we thoroughly enjoyed on the Oregon coast. Yes… I’m still blathering about the O.C. 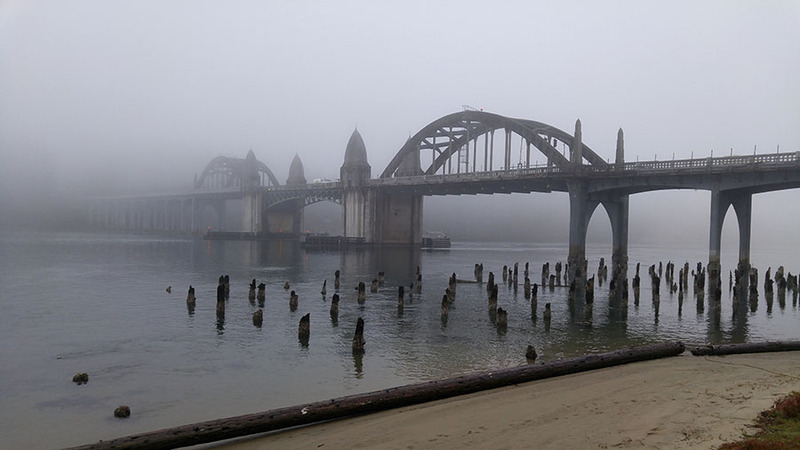 I have one more post after this one to get you all caught up before I start in on the perpetually adorable way that our town celebrates the Christmas holidays. Brace yourselves. 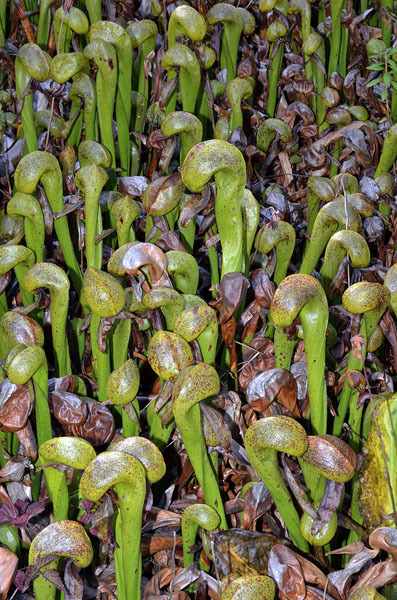 Right near our Florence-area campground we found the tiny Darlingtonia State Park, home to the protected cobra lily properly known as Darlingtonia californica – a carnivorous member of the pitcher plant family. This time of the year they’re looking pretty sad and brown, but they’re still very interesting to see. Springtime is when they’re the most beautiful. Florence was a nice little town, and we spent a misty rainy afternoon exploring the shops along the waterfront. Nothing like a little “retail therapy” in a fancy kitchen store followed by a dish of ice cream to satisfy body and soul. We found a cozy restaurant for dinner later that evening, but first we had to work off some calories with a hike on the Hobbit Trail. 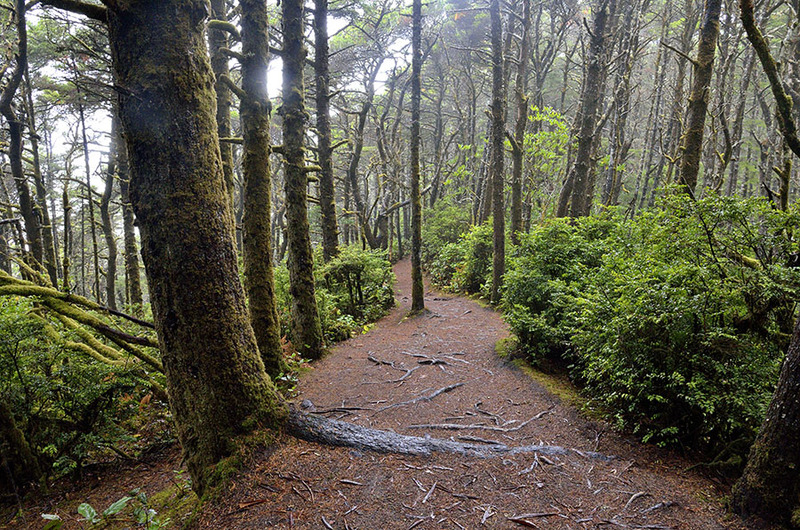 The drizzly, moody weather made the Hobbit Trail feel even more “hobbity,” and we kept a sharp eye out for short creatures with furry feet. Alas, we didn’t spot any creatures, but we did end up on a beach that we had all to ourselves. We walked along the eroding cliff face, keeping one eye on the surf that occasionally threatened to wet our boots despite the ebbing tide. 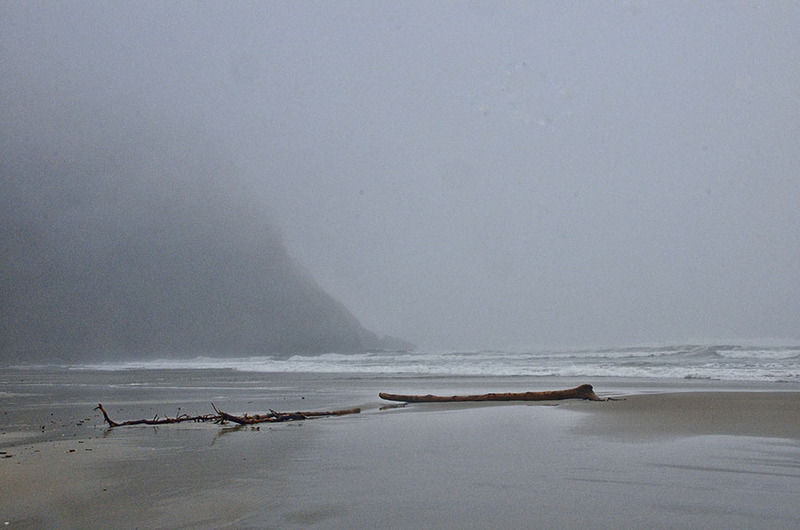 It was sublime – just us, the breaking surf and the swirling mist. 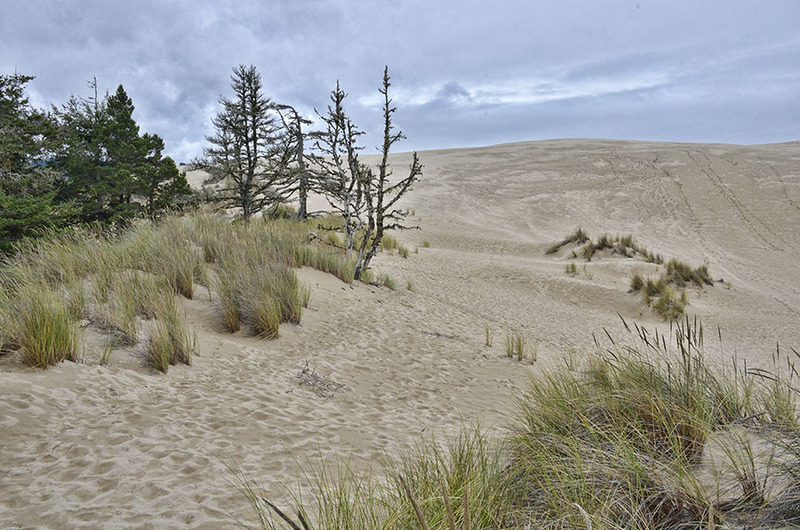 Florence also marks the northern end of the Oregon Dunes, a 31,500 acre national recreation area that extends along almost 40 miles of Oregon’s coastline. 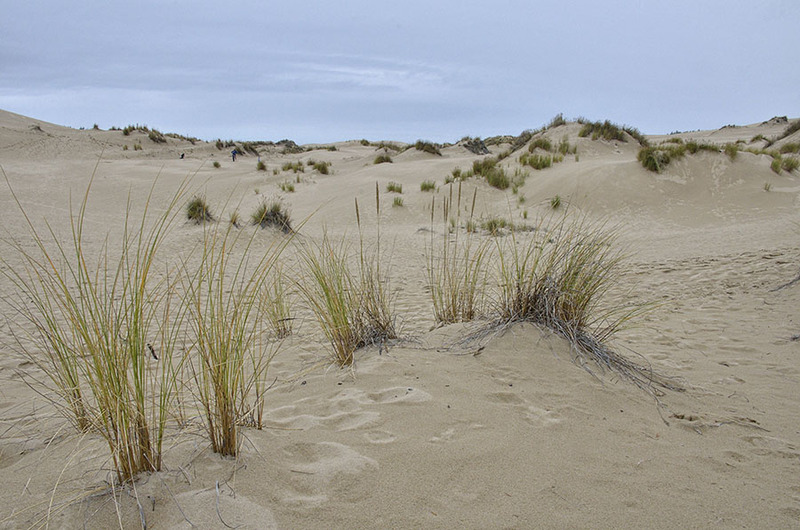 The dunes are formed by wind and rain erosion of the nearby mountains, with some as tall as 500′. 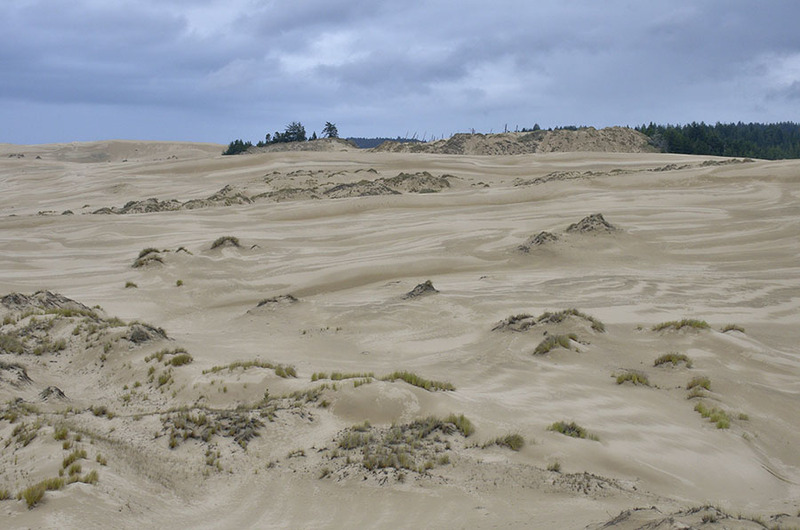 These are the largest coastal sand dunes in North America, and you can enjoy them on foot or with some type of Off Highway Vehicle (OHV). We didn’t have as much time as we would have liked to explore the dunes, but what little we did left us craving more. I read about the John Dellenback Trail that has some of the tallest dunes, so we focused on that area for a big exploration. 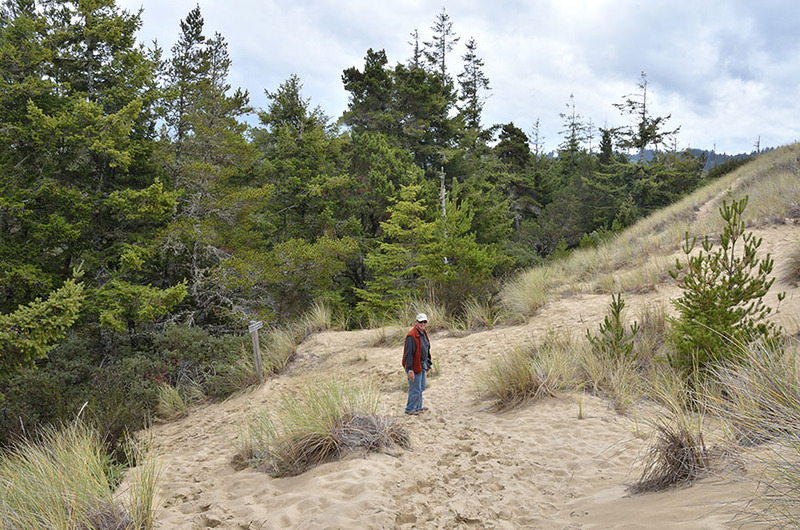 What’s fascinating is the abrupt change from forest to dune. There is no way for photographs to convey the scale of this place. Can you spot the three people in the photo above? 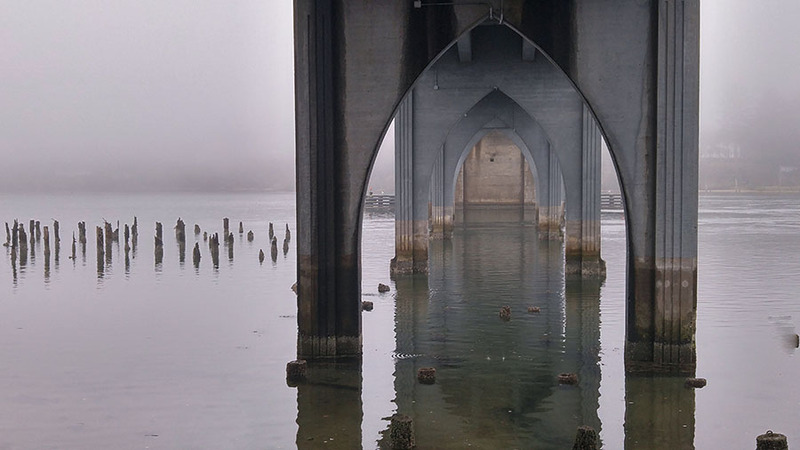 They’re just tiny specks – I would not want to get lost here. 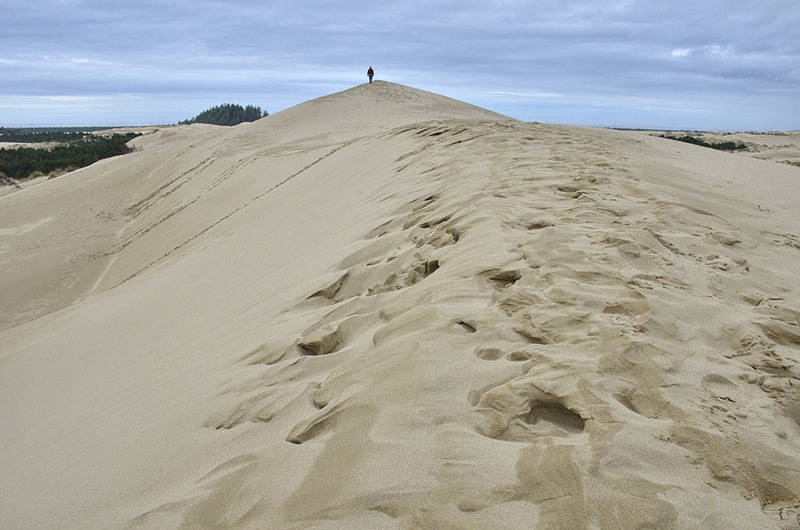 Although hiking in the soft sand was pretty tiring, we could not come all that way and miss climbing to the summit of the big dune. The effort was worthwhile, giving us a panoramic view of forested mountains to the east and the ocean to the west. The wind made patterns in the sand, and blew a fine mist off the crest. We didn’t see too many other people, making our exploration feel wonderfully solitary and remote. We did encounter a couple taking their two dogs and a goat on the trail. Yes, a goat. Apparently the goat thinks he’s a dog, and can’t stand to be left behind. Why not? 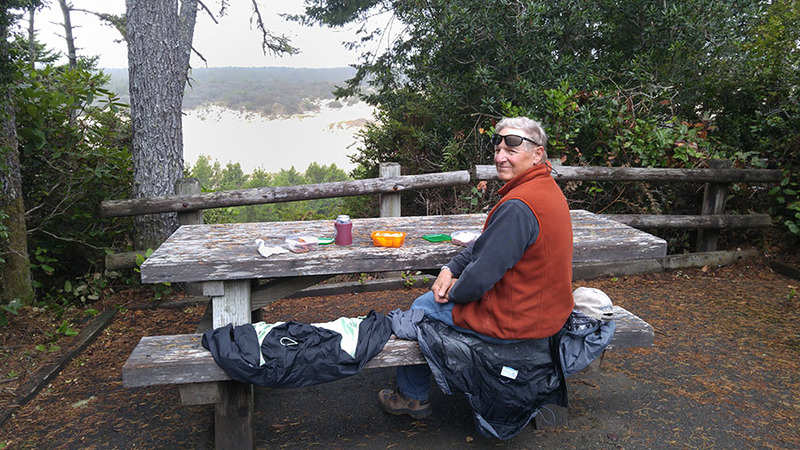 We enjoyed a little picnic lunch after our hike, and savored the view of this marvelous and unique area.